Toy Nippon: CatalogPics: Kamen Rider Wizard DX Role Play Items and More! 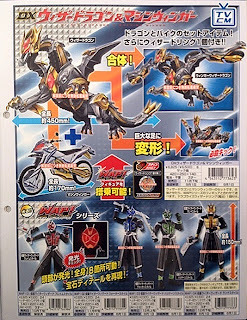 CatalogPics: Kamen Rider Wizard DX Role Play Items and More! 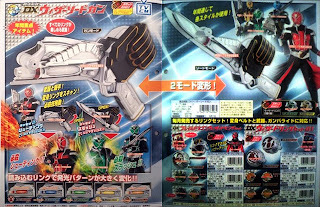 Catalog images of Kamen Rider Wizard DX role play items and toys are making their way around the interwebs. Let's see what's in store for this upcoming magical Rider! **If I have a ? next to something, it means I can't read the kana clearly and am guessing from what is legible. 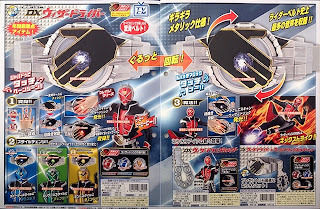 ** First thing to note is that the hand buckle rotates all the way around and has a couple of modes: henshin and mahou. When wearing a Wizard ring on your left hand and placing it across the buckle in henshin (transform) mode, it lights up and says Shabadoubi (shah bah dou bee) Touch ~ Henshin! Kamen Rider Wizard has 4 style changes: Flame, Water, Hurricane, and Land. He uses corresponding Wizard rings to switch between those styles. When wearing a magic/attack ring on your right hand and placing it across the buckle in mahou (magic) mode, it lights up and says Rupacchi (roo pa chi) Magic Touch ~ Go! Magic rings such as Big and Copy will surely be released with others to follow as the show progresses. Anyway, if you buy just the belt, it comes with the Flame Wizard ring, Water Wizard ring, and Kick Strike(?) ring. You can buy the DX Wizard Ring Holder separately as well and it comes with the Driver On(?) Wizard Ring. But you'll probably want to buy the DX WizarDriver & Ring Holder and get it all together. September release for the belt, October for the holder and belt/holder combo. The WizarSwordGun has two modes of course: gun and sword. In either mode, you pull on the fingers to activate the final attack. In gun mode, the gun says Kyamono Shooting Shake Hands for its final attack and in sword mode says Kyamono Slash Shake Hands. And it looks wearing different Wizard rings will change the color and pattern of the lights in the WizarSwordGun. The DX WizarSwordGun will include the Hurricane Wizard ring and Land Wizard ring. September release. DX ring sets that include Ganbaride cards will also be available. Flame Dragon Wizard Ring Set, Hurricane Dragon Wizard Ring Set, Water Dragon Wizard Ring Set, and Wizard Ring Sets 1,2 and 3 (October, November, and December releases). 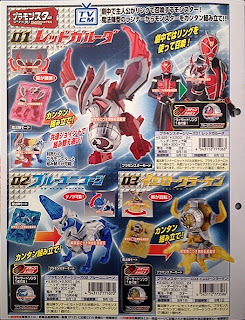 PlaMonsters (plastic monsters, the term is derivative of plamodel which is short for plastic models) are creatures that assist Kamen Rider Wizard. The parts of each PlaMonster are stored on runners that look like cards and combine with the ring that comes with it. The lineup will start with 01 Red Garuda in September, 02 Blue Unicorn in October, and 03 Yellow Kraken in November. 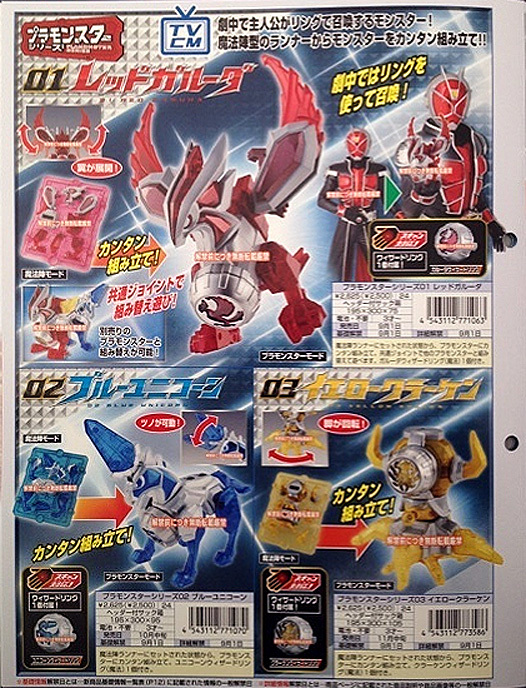 DX WizarDragon & Machine Winger can combine to form WingerWizarDragon. This set will include the DragoRise(?) Wizard ring and will be released on November. The WAP Series figures can interact with the DX WizarDragon and Machine Winger. Flame Style is out October, Water Style in November, and Hurricane and Land in December.